As a professional water systems contractor, you’ve probably faced situations like this: you’re installing a submersible pump/motor, and the homeowner wants to know why a submersible unit costs “so much”. He may have formed this opinion because he recently replaced a motor in an HVAC unit, a sump pump, or even a jet pump. In any case, chances are good that he is comparing the submersible to an aboveground motor or pump. As you know, this is a classic case of comparing apples to oranges, since submersible motors are very different from aboveground motors. This issue of Franklin AID will review some key aspects of submersible motor construction in order to help professional water systems contractors like you explain to a homeowner why a submersible motor appears to be more expensive, but worth the cost. In a nutshell, submersible motors are far more highly engineered and sophisticated than aboveground motors for two reasons. First, they are expected to be more reliable, and second, they operate in a much more difficult environment. Let’s discuss reliability first. As any water systems contractor knows, when a submersible motor fails, it generally means a crisis for the end user, whether real or perceived. That is, a household is out of water, there is no water for crops or livestock, and so on. Compounding a submersible failure is the fact that the motor and pump are generally not easily accessible. Unlike a jet pump for example, the submersible requires special equipment and expertise to pull. The bottom line is that above all else, a submersible installation must be reliable. The bar is far higher than with an aboveground product, and that reliability has to start with a higher degree of engineering and manufacturing technology that goes into the motor and pump. The other factor that makes a submersible motor significantly different from an aboveground motor is its operating environment. A submersible motor is subjected daily to all sorts of things that an aboveground motor never has to face. For example, the first thing most of us learned about electricity is that it doesn’t mix with water. But that’s exactly what we do with a submersible motor when we put it under water. In addition, it is often not only under water, but deep under water. To complicate matters, the corresponding pressure is not constant in most submersible installations. That is, as the well draws down, the ambient water pressure surrounding the motor decreases. Then as the well recharges, the ambient water pressure increases. This cycling action can be even more demanding than high, yet steady, pressure. All this is in stark contrast to a sump pump motor, for example, that is expected to survive just a few feet under water at most, or an aboveground motor that never sees water at all. The most obvious engineering and manufacturing challenge of a submersible motor then, is to keep water away from the electrical parts of the motor. Franklin Electric submersible motors address this in two steps. First, like most submersibles, Franklin motors use an induction run design. This means that there is no electrical contact between the stator and the rotor, and therefore no electrical current flows between them. The electrical part of the motor is confined to strictly the stator, which contains the motor’s electrical windings. These windings create a strong, rotating magnetic field that interacts with the rotor and causes it to rotate. The area between the stator and rotor is filled with a solution that is mostly water. Second, to keep the water away from the electric part of the motor (the windings), Franklin encapsulates and hermetically seals the stator. That is, not only is the stator protected by a welded lining to seal it from the outside world, but also the windings themselves are surrounded by an epoxy resin. This is different from most aboveground motors in which the windings are generally open to the air, making them far less expensive to manufacture. 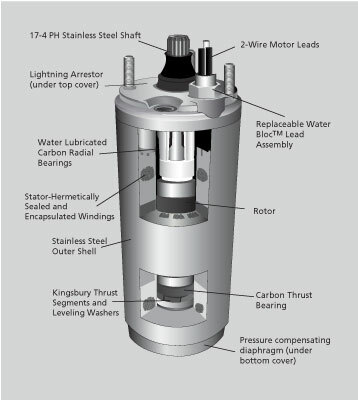 Another unique feature of a submersible is the Kingsbury thrust bearing, necessitated once again by the unique environment in which this motor operates. That is, when a submersible pushes water up the drop pipe, gravity and the water push back. As a result, a submersible pump and motor combination has to be able to withstand some serious downthrust. This downthrust can range from a couple of hundred pounds to thousands of pounds, depending on the application. In a submersible motor, it is the job of the Kingsbury thrust bearing to bear this downthrust. This bearing consists of 2 parts: a carbon graphite ring located on the bottom of the rotor, and precision-machined stainless steel segments. As the rotor moves, the fill solution inside the motor is pulled across these stainless steel segments, creating a very thin film. Since water cannot be compressed, this thin film creates a hydroplaning effect. Remarkably, this film can withstand extreme pressure without compromise, and as a result, the Kingsbury thrust bearing has almost infinite life. As mentioned above, a submersible motor must also compensate for changes in the ambient water pressure. For example, when a submersible motor is lowered into the well during installation, the water in the well tries to squeeze itself into the area of the motor occupied by the fill solution, that is, the area between the stator and the rotor. To prevent this, Franklin uses a pressure-compensating diaphragm to equalize the pressure inside and outside the motor. As the well draws down and then recharges, this process happens over and over again. Once again, this is something that aboveground motors don’t have to deal with. Electrical surges, whether from lightning or other sources, offer yet another challenge to submersible motors. The problem is that electrical surges seek the best path to ground, and there is generally no better ground than a motor submerged in groundwater. To tackle this challenge, Franklin Electric single-phase motors come with surge arrestors, either in the motor itself or in the control box. These remarkable devices provide an easier path to ground than the motor itself. This protects the motor and the homeowner’s investment. So to summarize, the next time you need to explain to a homeowner the value of a submersible motor, don’t forget to remind him that a submersible motor is a highlyengineered device that is unlike any other motor in the world. It has to live deep underwater and survive extreme pressures, electrical surges, and up to thousands of pounds of downthrust. In addition, we expect that motor to operate worry-free for many years to come. Fortunately, the technology and manufacturing expertise behind Franklin Electric submersible products are better than ever. In terms of value and performance, a submersible private water system remains just about the best deal anywhere.